Blue Dogs aren't as toxic and dangerous to progressive values and ideas as Republicans-- at least not since the GOP moved precipitously to the right. But Blue Dog Democrats today are pretty much what moderate Republicans were-- when there were moderate Republicans. They favor business interests over the interests of ordinary people, champion corporation's rights over the rights of consumers and workers and they add to the grotesque imbalance between the power of big money and the rest of us. They wind up in tactical alliances with reactionaries on specific issues that bring them into more generalized alliances with reactionaries on social issues. Not too long ago the Blue America community felt the sting of betrayal from one newly elected Blue Dog, Chris Carney (PA-10) who we endorsed, promoted and helped raise money for (from 722 of our members). After steadily accruing one of the most reactionary voting records of any newly elected Democrat-- right up there with Brad Ellsworth (IN), Joe Donnelly (IN), Jason Altmire (PA), Rahm Emanuel's Heath Shuler (NC), Nick Lampson (TX) and Baron Hill (IN)-- Carney upped the ante by breaking a direct promise with a gratuitously homophobic vote against the Hate Crimes bill (one of only 14 Democrats to vote with the GOP hate mongers on that). Unlike the other reactionary freshmen listed above, Carney tried passing himself off as a progressive and specifically promised to vote for the very bill he opposed, a bill that even conservative Americans agree with. Right after the election one of the Capitol Hill tip sheets listed all the newly elected members who had applied for membership in the two right of center Democratic Houses caucuses, Ellen Tauscher's New Democratic Coalition and the Blue Dogs. Carney's name was on the NDC list but at least not on the Blue Dog list. Today the Blue Dog Coalition put out a list of all the new Blue Dogs who have just joined. They don't accept everyone and limit new members to the 5 worst applicants. Carney, of course, was accepted. The other 4 the Blue Dogs accepted were Gabby Giffords (AZ), Bart Gordon (TN), Zack Space (OH) and Nick Lampson (TX). The five new members were approved by the Coalition at its weekly meeting Tuesday. Three other Democrats-- Reps. Harry Mitchell of Arizona, Nancy Boyda of Kansas and Henry Cuellar of Texas-- also hoped to join the group, but it limited new memberships to just five. I guess they just weren't voting as frequently with John Boehner and Roy Blunt to make the grade. Of the 5 new members (and the 3 would-be members), all were among the 86 Cheney-Democrats who voted with the Republicans and against Speaker Pelosi to write Bush a blank check for the continued occupation of Iraq. 140 Democrats voted to end the occupation. Although the Blue Dogs claim to be the fiscally conservative wing of the Democratic Party and to represent the center of the House of Representatives and appeal to the mainstream values of the American public, their members were the core of the Bush coalition to fund the occupation. The following Blue Dogs all voted to keep the occupation going, very much against the "mainstream values of the American public:"
The Blue Dogs not voting to give Bush a blank check in Iraq included a few who genuinely oppose Bush's radical right foreign policy agenda (Patrick Murphy, Mike Arcuri. 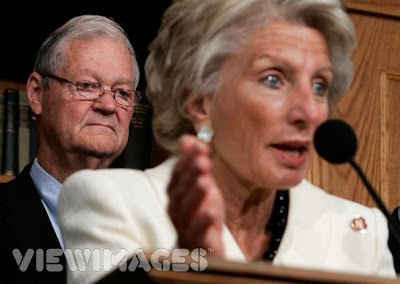 Mike Thompson) and a gaggle of conservatives who fear grassroots Democrats in their districts who have made it clear they will not accept their congressmember voting for endless war: Jane Harman (CA), Adam Schiff (CA), Loretta Sanchez (CA), and Steve Israel (NY). Howie, This is OT, so forgive me, but great news!! A proposed ban on gay marriage in Massachusetts was defeated!! MA will continue moving forward--we will not go back! !